25 Youths from Slovenia, Croatia, Italy and Estonia came at one place Hrvoji, village from where you have a view on Croatia in one direction and Italian city Trieste on another. Surrounded with conserved nature, wild forests, far away from the civilization like we are used to live. We gathered here to participate in Erasmus+ project held in Community of living, appropriately called Sunny Hill. In 2013 a group of enthusiastic people decided to buy an old house located just next to church tower (used to be a forum) and close to cemetery, which brings atmosphere of historical heritage. House, with garden and open area was well restored and in the moment is a home of 8 permanent, few temporary members and many more volunteers from all over the world. Also, since Community has their own organisation they are often holding events and projects like this one, to raise awareness of their existence. Additionally, focus of this project was learning about sustainable and mindful ways of living and introducing some of Art therapy methods. We all, as participants, were informed about program and activities, but nobody couldn’t expect how next two weeks is going to change our life perspective and brings us closer to our inner selves…. First day we could choose between sleeping in house or in tents, depending on our commodity and wishes, so we were immediately conduced in space where we will stay. The dinner was already prepared for us, who came later, and we start getting to know each other until sleeping time. Breakfast was every day at 7:45 in the “Secret Garden”, space where we will be eating, chantting, playing, chilling…spending most of our free time in future days. Next day, we continue connecting through some creative and group dynamic games. At that point we were still trying to remember all the names but already being interested about finding out more about our backgrounds, interests and childhood. Also, from the beginning was evident that we will have to use our creativity and open imagination for better realisation of the project. Program was organised that after breakfast we had before noon activities, coming up lunch and little break in between. Since we are all so different and living in community can be challenging, we were organised in working groups, responsible for certain daily tasks, together with one person from Community. So, we had groups for: preparing breakfast, washing dishes, cleaning toilets (which was everybody’s favourite), tidy up house and of course, celebration. Having a daily responsibilities and initiation as a team, was very important for realising what we do influence on whole community. One great way of celebration was singing a song (or more of them) before lunch to show thankfulness for food and cook’s hands. Lunch was always deliciously prepared from fresh gardens vegetables and local ingredients. Next days we were getting more and more into sustainable living and gaining information about it. 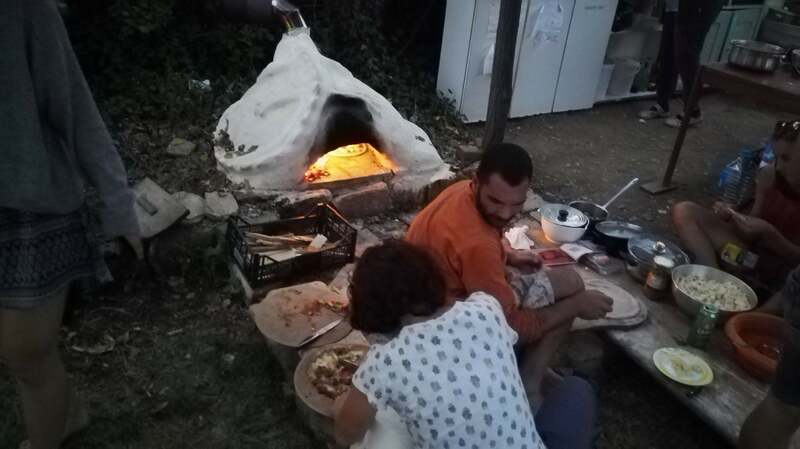 Nara Petrović; one of the Community founders, writer, facilitator, traveller, natural lover and many more, was willing to share some of knowledge that he collected about this topic. He was speaking about other organisation with good sustainable practice, like Global Ecovillage Network. Furthermore, we could find out a little bit about Pattern Language (theory of Christopher Alexander) and how important is to start finding patterns in our life habits and in world around us. One of the stress out topic during the whole project was Permaculture, or system of agricultural and social design principles centered around patterns and features observed in natural ecosystems. We were speaking about each principle and how to apply it in our daily life. Few times we had schedule community work which means we could put this in practice and grid skills about building houses, cooking and conserving food, working on a field. This could give us the real feeling of living in community, being useful and even getting sweat sometimes to enjoy more after in free time. Our senses for orientation and surviving in group were tested third day when we had adventure game in local environment. We have been separated in groups of five, given one map with drawing of path where to go with goal to find 4 cards, do certain funny tasks and come back home alive. For some of groups that was easy and fast, some of us get lost and decided to make our own adventure, some people get lost for real…on the way we were meeting local people, admire beautiful nature and becoming real friends in trouble. All different stories of adventure were shared the same evening supported by photos. I remember, this evening we were laughing like not many times before. Mission was accomplished: to have fun! One before noon activity was reserved for theWorld café, structured conversational process for knowledge sharing in which groups of people discuss a topic at several tables, with individuals switching tables and getting introduced to the previous discussion by a “table host”. This time topic was influence of infinity growth population on planet and how to prevent the consequences of it. We were sharing our ideas, discussing about solutions and imagining world where we could live our dream without hurting anyone saving the Earth for next generations. This rise our awareness of preservation sources and bring some “alternative” ideas for brighter future. We were also learned how to bring all of this into practise using methodology called Dragon Dreaming. It’s a systematic design process, a philosophy and framework, for the realisation of collaborative and sustainable projects, organisations and platforms, built upon three principles: personal growth, community building, service to the Earth. Originally, idea comes from John Croft and his wife, finding an inspiration in ancient sustainable wisdom of indigenous cultures and Australian Aborigines. In them believes, when we dream we are living our reality and dragon is a symbol of fortune, good luck. One of the biggest parts of this project was left on creation for us, participants. In practise that means we all could bring out our wishes for learning and offer our talents to prepare workshops in duration of 2 hours approximately. In the same time was offering more workshops so everybody could find something interesting. During four times of open space we had creative craft workshops like making bracelets and dream catchers, face massage and shiatzu workshops, guided dance of 5 elements and how to use dance and imaginations for Art therapy. Then, we could learn how to make homemade natural nettle/curry soap and lipstick. 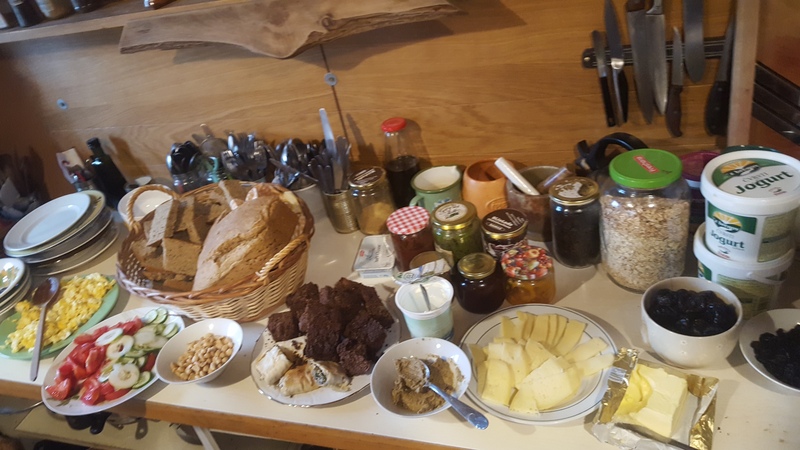 Another laboratory was kitchen, so we try ourselves in making energy balls, jams or making fresh bread. One very interesting workshop was about walking in group on aware and meditative way with music, professionally called Siera. This way of doing activities was good opportunity for all to try being in role of tutor sharing own talents, empowering our confidence and bring us together even more. All this was enriched with lectures from wise members of Community, especially from women called Vida, who explain us how to be better facilitator and shown us effective techniques for working with groups. Moreover, she had an amazing ceremony workshop of making a womb belt with special dedication which united all women (and one man) together and remind us to celebrate our nature. Another important part of project was to become more comfortable with improvisations, in dance and theatre. Since we are not professionalising at any of this art we should have use our creativity, voice, body, experience and freedom to experiment with our limits of existence. First, with excellent guidance of Italian brother and sister, we tried out contact improvisation in dance. Basically, after deep relaxation on the floor we start moving slowly, crawling and rolling without stopping, passing by each other’s bodies. In those moment, we were invited to let go all borders, stereotypes and shame to connect deeply with people around us. Next, we tried out some dynamic exercises in couples to feel even more safe in our bodies. For the end we were jamming in podium trying all different possible movements. All was followed by excellent music rhythms! Like I mentioned, we improvised in drama too. It was a sunny day when one sympathetic young man came to show us how to have fun without even saying a word! We were playing different kind of games using just our gestures, posture, mimic and sometimes voice (like gibberish or singing). Key point of this kind of theatre is interaction with audience who is giving ideas for next scene. Since you could never be really prepared what will happened next you are brought to situation to lean on your imagination. This way of interaction with another partner(s) brings out many humorous ideas which (usually) make people laugh. Since one of the main aims of Youth Project is cultural exchange, we had national dinners with Italian, Croatia, Slovenia and Estonian food and traditional music. Of course, we enjoyed Italian pasta and tiramisu, but probably most surprising was richness of Estonian culture. They honoured us with palette of games, dances, playing bagpipes and singing magical Estonian songs. Also, as being curious about language we were trying to remember few words of foreign language but most of all we were improving speaking English. From the early beginning we were questioned what we expect from this project and how we can contribute for good group synergy. Having a “check in” every day in our working group was a great opportunity to think about how we feel, what we learned so far (by remembering “Aha! moments”) and recall our dreams from previous night. Further, with regular evaluation we could speak in circle about opinions, emotions and suggestions for improvement. During this, emphasis was on active listening and self-reflections. Besides, silent moments in meditation were importantly respected and blessed. On this way we could better understand ourselves and each other’s. One of the escalation moments of opening to group was Truth Mandala where we had opportunity to share our life stories talking about deep emotions: sadness, fear, anger, hope, emptiness…and being heard from circle without any comments or judgements. For two weeks we had an open playground to reach our potentials, dreams and desires. We were living a moment of presents in real utopia. How was that possible? From second day on, you had a chance to start day with yoga thanks to our lovely instructor Helena. Moreover, since house is equipment with musical instruments you could play or listen to music in every free moment. For those who were oriented more in movement, you could find circus equipment all around. In case of call for solo moments, you could easily find a place in living room or outside in nature for meditation, drawing, writing, reading or daydreaming. Just like enjoying in groups, respecting a private space was also very important. To feel even more special, we all had our secret friend who was surprising us with small (or big) gestures of kindness, gifts and messages. We also spoiled ourselves during the free day going on beach, swimming, eating ice cream, exploring other locations. Talking about spoiling, we were giving and accepting massage on every step, hugs was like oxygen, realising that is never enough of human contact. Last two days we were celebrating new friendships and process that has been made. First, we organised local event where we invited citizens from surrounding villages. Except for socializing, purpose of event was sharing of new experiences, so we prepared small show with improvisational theater to entertain audience. Afterwards, people could try traditional Estonian snacks and then have fun with games or dances. 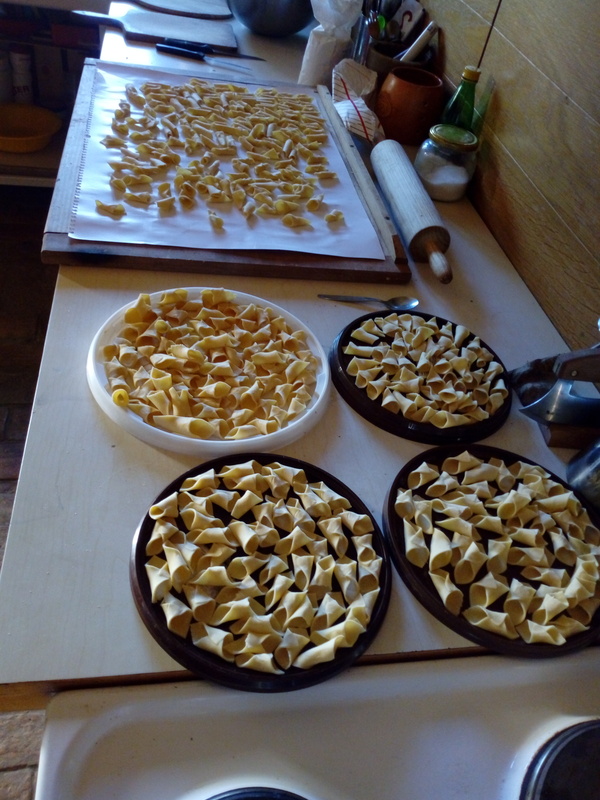 In the end, we collected around food and tried fuži, traditional Istrian meal with truffles. Yes, it was a real feast and we ate a lot that night! Later, we gathered all around fire and continue celebrating with guitar and wine long into the night. Next day nobody was hangover, so we could make our last group evaluation and brief introducing to future project or how to make one. Also, we had opportune to come personally “one to one”, clear if there was still any obstacle or just share our view about certain person. We finished with peaceful eyes gazing. After early lunch we went on seaside all together and spent a wonderful time on sun. On the way back home, we stopped in olive oil farm where we had a little tour with lecture about their lordship. As real hedonists, we had professional olive oil tasting, whereupon we enjoyed in delicious food with breathtaking view on sunset. Special thanks to Zadruga Dobrote for donation of sheets and blankets. The project is financed by: Erasmus+ Youth in action.